Steve Hillage is a very well-known English musician, best known for his superb guitar work. He was closely associated with the Canterbury Scene (or Sound) which was a group of prog rock, avant-garde and jazz musicians based around Canterbury in the late 60’s/early 70’s. Steve has worked mainly in experimental domains since that time and besides solo recordings (14 albums), he has been a member of Gong, Khan and System 7, as well as being associated with Uriel (Arzachel), The Orb and Clearlight. This latest release, Rainbow 77, would, one surmises, be the issue of a concert at the Rainbow Theater in London. Material appearing on the album has come from the solo releases, Fish Rising (1975) and L (1976) and the album that was just about released, Motivation Radio(1977). Despite a fair search across the web, there seems to be very little agreement about this particular release. 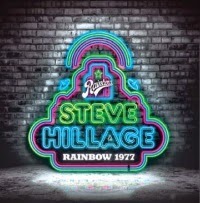 There were 2 Steve Hillage concerts in the Rainbow during 1977, apparently March and November. Consensus seems to suggest that this is a recording of the later concert, and Steve does announce the musicians on stage with him during the show, which confirms the November setting. The musicians involved in Rainbow 77 are Steve Hillage (guitar, synths and vocals), Miquette Giraudy (synths, sequencers, bells and vocals), Joe Blocker (drums and backing vocals) and Curtis Robertson (bass). “Octave Doctors” (4:07) opens Rainbow 77 and is greeted by the sound of a very enthusiastic audience. Some excellent guitar and keyboard carry the instrumental theme along with some really solid foundation work by Joe (drums) and Curtis (bass). The link into track 2, “It’s All Too Much” (6:17) is seamless and the keyboards power out the melody closely followed by the guitar. This is a very simple catchy track with the characteristic voice of Steve in fine form. Some very tasty guitar just prior to the 2 minute point really fires the musicians along and the track is simply a gem. “Light In The Sky” (4:22) has a thumping drum intro into some heavy guitar riffing before the vocals edge into the proceedings. There is some interesting interplay between the voices of Steve and Miquette. A short, but sweet, track which maintains the momentum with again that superb guitar from Steve and almost UFO sounds effects from Miquette. “Radio” (7:31) is a very different styled track with some natural (countryside?) noises mixed in behind an acoustic guitar. There seems to be an underlying effect of trying to emulate the constant changing of the frequency of a radio, before the track settles down after around 2:30 minutes. This is a more experimental track which draws the listener in, the longer it evolves. This is then followed by handful of tracks that are very clearly both audience (and band) favorites, ”Electrick Gypsies” (5:35), “The Salmon Song” (3:42) and “Solar Music Suite Part 2” (7:10). “Motivation” (6:41) is a “ripper” of a track with stunning guitar that simply soars and pulls everything, and everyone, along with it. Following that track, the new sport of “Saucer Surfing” (8:14) shows that superb guitar work from Steve, in front of a thundering rhythm powerhouse. The penultimate, and longest, track on offer is “Searching for the Spark” (15:15) and allows the band to evolve the style of music that Steve is associated with, long meandering guitar based music with some excellent keyboards/synths burbling away just under the surface, kept in check with the rhythmic “engine room” and the track is simply a joy to listen to. The final track, “Hurdy Gurdy Man” (5:04) is a stalwart of the Steve Hillage live shows and is certainly a very different prospect to the original, Donovan, single. The excellent guitar playing, synths that burst in here and there, but burble away constantly and a superb drum and bass duo ensure that this is a very pleasing live album and easily remembered. Rainbow 77is an excellent release and the sound quality is very high, always a potential downside with some live albums, but my one little bugbear with this release, is why? Much, if not all of this material is available on other live albums and although the tracks might vary slightly from one recording to another, I am not sure that it really justifies Rainbow 77’s release. While it might be an essential purchase for Steve Hillage followers, it might, however, also be an entrance into the music of Steve Hillage for those wishing to dip their toe into this style of music? The band deserves plaudits for this concert and the sheer electric atmosphere that seems to have been present is conveyed well across this recording. Give the album, Rainbow 77, a few listens and decide whether you want to add it to your collection or not.